Cc.chango.com is the PUP that uses misleading techniques to prevent removal. Use Reimage to locate malicious components and get rid of them faster than with uninstall instructions. A full system scan blocks virus reappearance and prevents traffic to malicious domains. Cc.chango.com virus functions as a website with no actual content. When you type in the URL address, you are not redirected to its official domain. Interestingly, this domain behaves differently in each browser. Needless to say that such behavior is far more than suspicious. Further analysis reveals that the website uses an invalid security certificate. Thus, if you get redirected to this potentially insecure website, make a rush to cancel all downloadable files if any will automatically occur and remove cc.chango.com scripts from the browser. Reimage or Plumbytes Anti-MalwareMalwarebytes Malwarebytes makes the process faster. Cc.chango.com virus attempts to download a shady file. Interestingly, it only does so when the website is launched with Chrome browser. When it comes to shady websites, their category is steadily expanding every day. Unfortunately, a large quantity of them serves for malicious purposes. While indeed there are useless but not so destructive web pages, there are many more possessing covert features. Observing the website’s behavior to automatically download shady content without users’ direct permission surely serves as an alarming call. Taking into account new phishing attacks, which do not require clicking on an infected link or simply hover it, the chances to encounter malware significantly boost up. It is unsure what menace contains the file downloaded from this PUP. 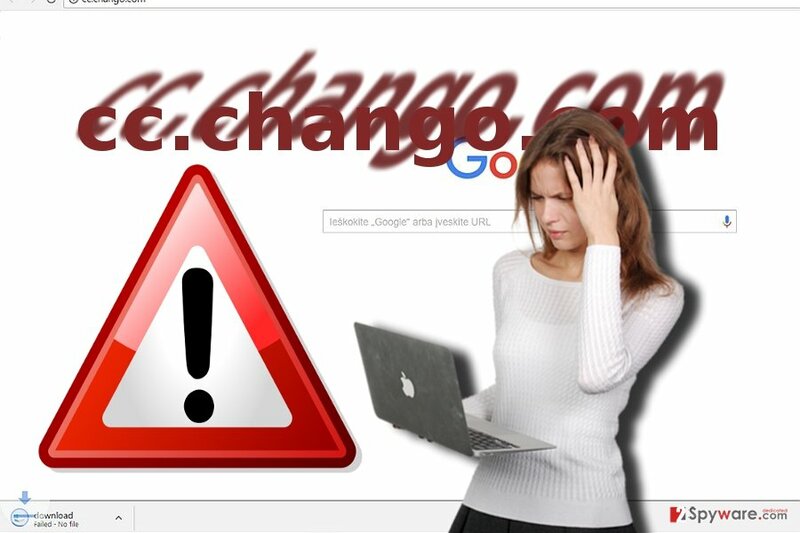 Since the infection manifests different behavior in different browsers, some users may not escape a bothersome phenomenon of cc.chango.com redirect. In short, it might mislead you to another more fraudulent domain. The analysis reveals that it is related with such web page as aws.rubiconproject.com. It is unlikely that you would deliberately visit this domain. On the other hand, such domains are often based on the mistyping technique. Since it is common to make typos when entering a site, many crooks exploit this vice to direct users into a trap. Likewise, you might have encountered this domain as well. Ordinary cc.chango.com hijack is unlikely as the website does not travel as an attachment but rather roams on the cyber space. Thus you may likely to encounter while browsing gaming sites or movie streaming websites. In order to prevent such redirect tendency to fishy domains, you should employ an anti-spyware tool. It will also help you perform cc.chango.com removal. It is recommended to remove cc.chango.com virus with the assistance of software due to a shady behavior of this tool. Since you can install or uninstall it manually, manual methods might not be so effective when it comes to web scripts injected by the PUP. Nonetheless, below guidelines still facilitate cc.chango.com removal. Note that some users, such as residents of Finland, might be especially vulnerable to the attacks of this malware. Here, look for Cc.chango.com or any other recently installed suspicious programs. Wait until you see Applications folder and look for Cc.chango.com or any other suspicious programs on it. Now right click on every of such entries and select Move to Trash. When in the new window, check Delete personal settings and select Reset again to complete Cc.chango.com removal. Once these steps are finished, Cc.chango.com should be removed from your Microsoft Edge browser. Here, select Cc.chango.com and other questionable plugins. Click Remove to delete these entries. Now you will see Reset Firefox to its default state message with Reset Firefox button. Click this button for several times and complete Cc.chango.com removal. It is highly recommended that you go through these steps to eliminate any associated web scripts with cc.chango.com virus. Here, select Cc.chango.com and other malicious plugins and select trash icon to delete these entries. Click Reset to confirm this action and complete Cc.chango.com removal. Here, select Extensions and look for Cc.chango.com or other suspicious entries. Click on the Uninstall button to get rid each of them. Here, look at the Homepage field. If it was altered by Cc.chango.com, remove unwanted link and enter the one that you want to use for your searches. Remember to include the "http://" before typing in the address of the page. Now you will see a detailed dialog window filled with reset options. All of those options are usually checked, but you can specify which of them you want to reset. Click the Reset button to complete Cc.chango.com removal process. ^ Bill Brenner. Infection by mouseover – what you need to know about PowerPoint spam. NakedSecurity. Award-winning computer security news. ^ Jennifer Edwards. Next Steps for Phishing Attack Victims . University of Kentucky News. ^ How to remove computer malware. https://virukset.fi . IT news, Reviews and virus removal guides. This entry was posted on 2017-07-04 at 05:08 and is filed under Malware, Viruses. You can quickly scan the QR code with your mobile device and have Cc.chango.com virus manual removal instructions right in your pocket. How did you remove Cc.chango.com virus?